A soap bubble is a very thin film of water and soap; in fact, its thickness can be on the order of a few wavelengths of visible light. Most of the light that hits a the boundary between two transparent media such as the edge of a soap bubble passes through, but a small percentage, about 4% for water, is reflected. The light's wavelength is also shifted when it enters and exits the bubble due to the change in medium, but this will be ignored to simplify the calculations. The reflected light is what creates the pretty colors in a soap bubble. Because there are two transitions, the inside of the film and the outside, there are two places for light to be reflected. However, because the soap bubble has thickness, the light waves will be out of phase. The light that bounces at the outside of the bubble is shifted by half a wavelength; the light that bounces at the inside will be shifted by the extra distance that it traveled. This leads to interference between the two rays colored red in the image. When two light waves meet at the same place, interference occurs. The resulting wave is the sum of the incoming waves; two peaks will add up to create a higher peak while a peak and a trough will cancel out. For a particular difference in phase, there will some frequencies of light that will interfere constructively and thus appear brighter; most other frequencies will interfere destructively and thus appear dimmer. Light in the visible spectrum is between 400 and 700 nanometers (1 nanometer = 10-9 meter). Colors are actually light with different wavelengths in this interval of the spectrum, with a wavelength usually specified in nanometers. A soap bubble is thickest at the bottom and thinnest at the top due to gravity. Therefore, the color that appears with the greatest intensity is different periodically throughout the bubble. A rainbow of colors thus appears, as shown in the picture. As water swirls throughout the film, stirred by air currents, the bands mix to form beautiful patterns. When the bubble is very thin, there is no reflection, so a dark spot forms on the top where the bubble is the thinnest. If multiple visible wavelengths are at maximum, the reflected light will be a mix of the visible colors. where t is the thickness of the bubble and λ represents the wavelength. If the difference (k) is an integer, the waves will interfere constructively and the intensity will be at a maximum; otherwise, the intensity will be less. 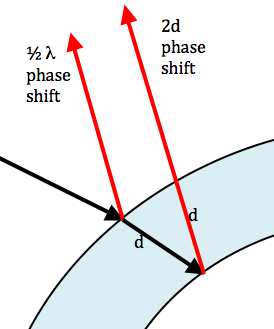 The minimum phase shift is 0.5 wavelengths; as the thickness increases, the phase shift will increase, cycling between integers and non-integers. If t is 300 nm, then the above equation becomes k = 600 / λ - 0.5. In the visible spectrum, k is an integer when λ is 400 nm. This translates to constructive interference at 400 nm, which corresponds to violet. Since no other peaks appear in the visible spectrum, the resulting color visible will be violet. An applet that interactively graphs this equation and displays the visible spectrum maxima for a given thickness of bubble is available below. You need Java, version 5.0 or greater, to run this applet.